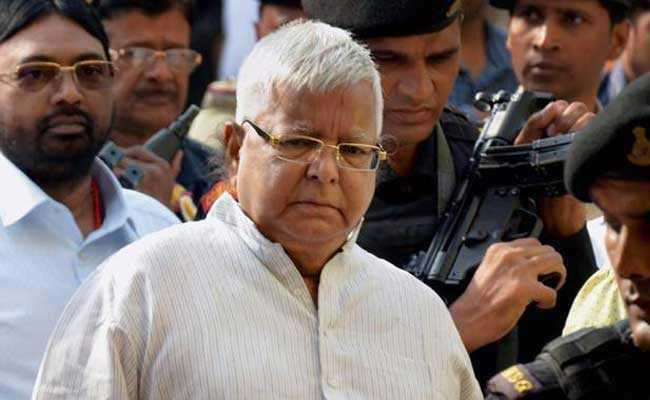 Fodder Scam Case: RJD chief Lalu Yadav has been convicted in another fodder scam case that cost him his Lok Sabha seat and disqualified him from contesting elections. Fodder Scam Verdict: The top court ruled that Lalu Yadav will have to face trial in fodder scam cases. Ranchi: A special CBI court in Ranchi gave its verdict today in a fodder scam case in which former Bihar chief minister Lalu Yadav was an accused. He has been found guilty and was taken into custody soon after the verdict. The sentencing will be on January 3. The case relates to embezzling of more than Rs. 89 lakh from the Deoghar Treasury between 1991 and 1994. The Rashtriya Janata Dal chief has already been convicted in another fodder scam case that cost him his Lok Sabha seat and disqualified him from contesting elections. Huge crowds gathered outside the Ranchi court ahead of the verdict. Following the conviction of The Rashtriya Janata Dal (RJD) chief Lalu Yadav in Fodder Scam today, party leader Manoj Jha spoke to the reporters and said, the "caged parrot" (as Supreme Court once referred to the Central Bureau of Investigation, or CBI) had been unleashed on political rivals who did not bow before the Bharatiya Janata Party (BJP). He emphasised that this decision would not weaken the RJD workers' resolve to fight their rivals politically, IANS reported. After the special CBI court verdict, Union Minister Ravi Shankar Prasad said the verdict was a "lesson for all". "This was the biggest scam of the country," he was quoted as saying by ANI. "It was scam of nearly one thousand crore in early 90's. In one case Lalu Prasad Yadav has already convicted for five years. For me it's a matter of personal assurance." He further said he had the "privilege" to argue the PIL in Patna high court in early 90's. 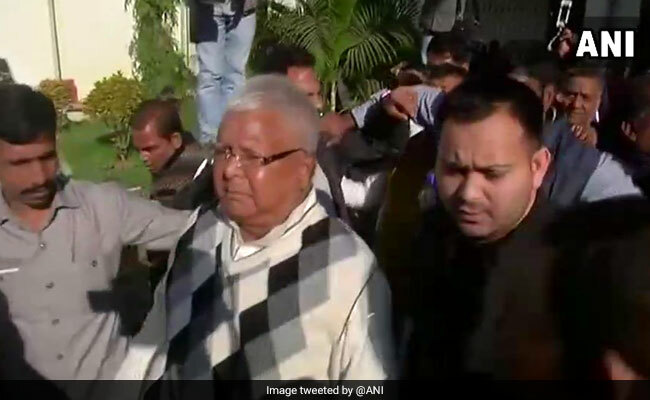 After a special CBI court convicted party chief Lalu Prasad in a fodder scam case today, senior RJD leader Raghuvansh Prasad Singh said the party would move the high court against the verdict, PTI reported. 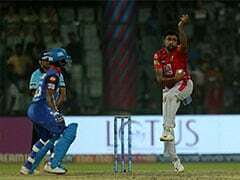 BJP leader and Bihar Deputy Chief Minister Sushil Modi took a jibe at Lalu Prasad Yadav and questioned the basis of blaming the BJP. Lalu was convicted for the fst time during UPA regime & now blaming BJP? How Bjp can influence judicial process?Court has convicted Lalu not Bjp. Union Health Minister and BJP leader JP Nadda reacted to the verdict and said Lalu Yadav was not accepting the verdict and was instead resorting to blaming the BJP. "Lalu Yadav is even now politicizing the issue instead of accepting the verdict, just to deviate he is leveling allegations of conspiracy on BJP," he told reporters. 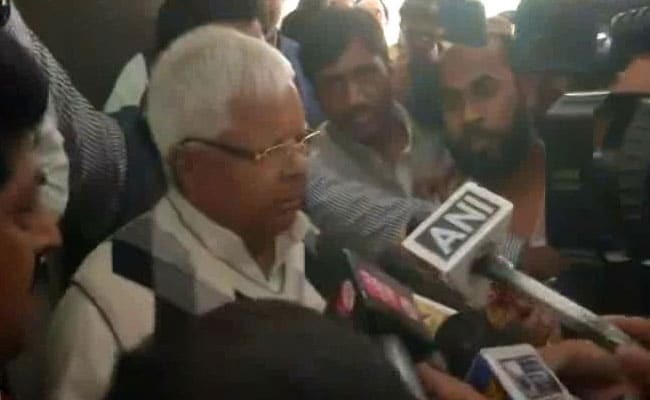 Lalu Yadav taken to Birsa Munda jail. Congress leader Manish Tewari said, "Lalu Yadav has been fighting this legal battle since 1996. It started when BJP leaders filed PIL against him in Patna HC. He & his lawyers are capable of fighting this case. I want to ask BJP why Srijan scam is not being investigated?" Lalu Yadav is posting a series of tweets after his conviction in the fodder scam case. Lalu Yadav tweets: A lie can travel half way around the world while the truth is putting on its shoes. ....But still prevails...In the end though. After his conviction, Lalu Prasad has tweeted, "Truth can be made to appear as a lie, as ambiguous or a half lie by concerted onslaught of bias driven propaganda. But blurred layer of bias and hatred will still be removed, come what may! In end Truth will win"
"I believe in judiciary but in this case, CBI was arranging prosecution. Legally admissible evidence provided by us were set aside," RJD's Manoj Jha said soon after Lalu Yadav's conviction in the fodder scam. Manoj Jha of Lalu Yadav's party RJD said, "The kind of evidences we have, we'll get redressal at a higher court. Politically I know this regime, they have this typical Standard Operating Procedure-try to make a deal with your opposition, if you fail, scare them. 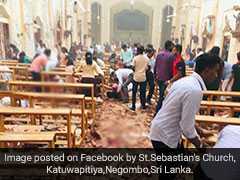 Want to tell them- your end has begun." Today's case relates to embezzling of more than Rs. 85 lakh from the Deoghar Treasury between 1991 and 1994. 15 others have been convicted along with Lalu Yadav. Six others have been acquitted, reports NDTV's Manish Kumar. Lalu Yadav has been taken into custody. Sentencing will be on January 3. Lalu Prasad Yadav to be taken into custody. BREAKING: Lalu Yadav has been convicted in fodder scam case. Former Bihar chief minister Jagannath Mishra has been acquitted. The court has started pronouncing its verdict. Huge crowds before the Ranchi court ahead of the fodder scam verdict. All the accused have been called to the witness box. The special CBI court in Ranchi pronounce its verdict any time from now. 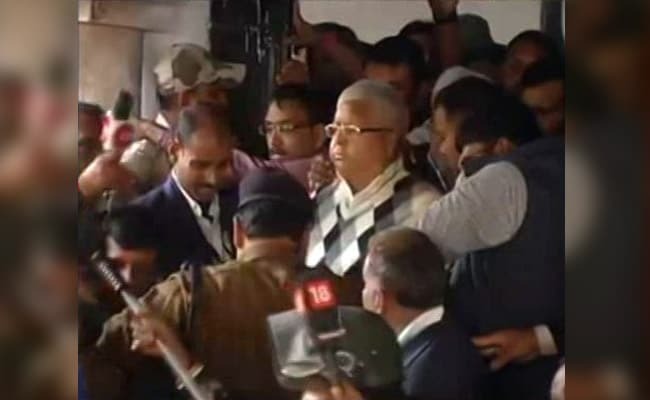 Lalu Prasad Yadav has reached the court as the verdict will be pronounced shortly. The Enforcement Directorate today filed a chargesheet against Lalu Yadav's daughter Misa Bharti and her husband in a money laundering case. 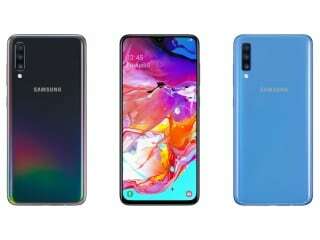 The probe agency had earlier attached a Delhi farmhouse in connection with its money laundering probe against Ms Bharti and her husband, Shailesh Kumar. Special CBI judge Shivapal Singh had completed hearing the case on December 13 and asked all accused in the case to remain present in court for the judgment. Lalu Yadav has left the special CBI court in Ranchi. Lalu Yadav had been charged in several cases related to the scam, in which Rs. 900 crore were embezzled from the state exchequer for fictitious medicines and fodder for cattle over a period of 20 years. The CBI started probing the case in 1996. Judgement in the fodder scam after 3 pm, reports NDTV's Manish Kumar. Lalu Yadav has reached the court in Ranchi. He says, "I am confident, will get justice." "We trust the judiciary & hope the verdict will be in our favor. 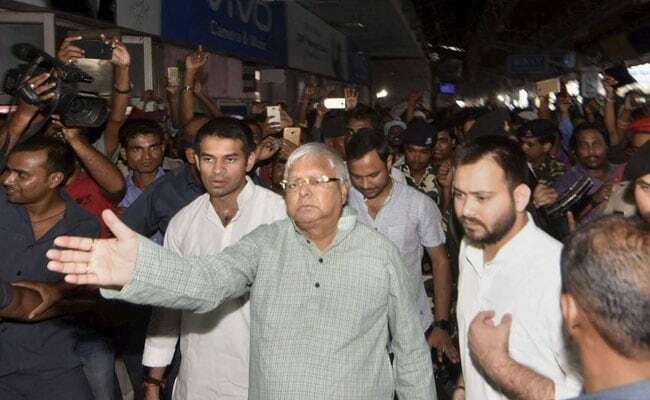 Just like BJP propaganda was busted in 2G scam and Adarsh scam, similar will happen now," Lalu Yadav's son Tejashwi Yadav told reporters ahead of the fodder scam verdict. BJP lawmaker from Bihar tweeted, "Hope wish & pray that the friend of the nation, hero of masses & favorite of downtrodden, one & only one Lalu Yadav gets the most desired & deserving justice. Satyamev Jayate??!!. God Bless!" Supporters of Lalu Yadav have gathered at the railway guest house in Ranchi. The last time Lalu Yadav stood before a judge set to pronounce its verdict in 2013, the Rashtriya Janata Party chief had worried who would lead the party if the court sent him to jail in the fodder scam. Not today. "I don't need to worry about the party... Tejashwi is there," Lalu Yadav told NDTV, hours before he was to appear before a CBI court in Jharkhand's capital, Ranchi, on Saturday morning. Apart from Mr Yadav, former Bihar chief minister Jagannath Mishra and 19 others are also accused in the case. 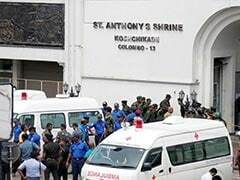 Of the 34 people initially accused in the case, 11 died during the course of trial, while one turned approver and admitted to the crime. Lalu Yadav, along with his younger son and political heir, Tejashwi, arrived in Ranchi on Friday evening for the verdict. "We trust and respect the judiciary. 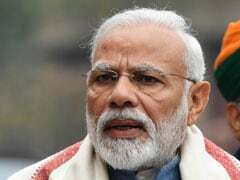 It won't let BJP's conspiracies work," he told NDTV, hoping that his verdict would be on lines of the 2G case.